Don't miss birthdays, anniversaries and business events with your Sony Ericsson P800 / P900. Anyone can send virtual card for birthday. Do somethingdifferent and send funny and cute Birthday screensaver. Find out how to customize it, add your names, texts, pictures, sounds and much more. . .
For a brilliant, professional-level solution to client birthday greetings, turn to Cardware. CardWare is a valuable asset for any businessperson who needs to stay in touch with clients in a memorable, timely, and personal way. The Birthday Chronicle produces a personalized mini-newspaper front page, including graphics, that will be treasured for years.The printout includes a greeting, by name, from the then-President of the United States, plus newspaper headlines & more. Create your own The Day You Were Born Personalized Newspapers This software creates as many attractive Birthday Newspaper Prints as you would like. Save money by sending these prints instead of birthday cards. Send them to your customers. Using the calendar reminder program to remind you email, birthday, appointment, bill and medication.It has daily, weekday, weekly, monthly view to ease managing events. This software also has customizable desktop clock, import/export, print function. MB Free BirthDay Number Software is a wonderful and user-friendly software, which highlights the day of the month that you were born. Based on this number, you can have an in-depth look at your own personality. T-Minus Birthday Countdown Clock. Looking forward to your birthday or the birthday of someone special? Now you can count down the time to the fun! T-Minus Birthday Countdown Clock. Looking forward to your Birthday or the Birthday of someone special? Now you can count down the time to the fun! You can play our Birthday song or insert a song of your own!Your anticipation will build as you count down the days, hours and minutes. ABC Birthday Reminder is an easy-to-use tool that keeps detailed information about birthdays and other remarkable events. If you want to avoid embarrassing situations and having to call your friends in an apologetic tone, check out this software! 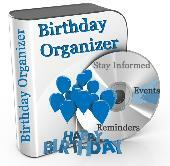 Birthday Book Plus is a Birthay, Contacts and Reminders database program. Reports are a strong feature of the program. The program was designed for the family but can be used for business also. Professional birthday card maker utility is best and cost effective way to design most beautiful birthday cards for your friends and relatives in your own style. Software is able for crafting cards in various shapes and size as per user need. Technically advanced and cost effective card designing software prove to be very helpful in producing attractive and colorful happy birthday cards for all relatives and friends like mother, father, sister, brother, cousins and other relatives. Advance image birthday card design software generates very attractive birthday cards in which we can add various colorful images of anything related to birthday person. Colorful and impressive birthday card software provides image designing tool. Award winning birthday Cards Designing Software allowed you to create most attractive and dazzling happy birthday cards to wish your friends, parents, kids, spouse etc by adding personalized messages and photographs with printing functionality. Professional greeting card creator utility creates colorful and high quality birthday cards for sending your best wishes to your friends, parents or any other relative/family members in your own creative style via using with some inbuilt features. Innovative birthday card generator tool prints nice and colored birthday cards to wish friends and relatives on birthdays. Professional birthday card software creates multiple birthday cards at same time using inbuilt advance printing tool. Birthday Card making utility has so many design object tools including pencil, line, ellipse, rectangle and star for designing purpose. User can freely use entire designing tools for making attractive and admire birthday cards within a less time. Easy to install birthday card maker application provides cost effective solution to generate eye catching greetings of your choice to wish your loved ones family, friends or relatives with your own handmade online birthday cards in simplest manner. Company present advance and affordable Funny Birthday Cards software to create and design standard and colorful birthday cards to wishes your family members, friends, business partner and dear ones in easiest convenient and professional manners. Reliable Birthday Card Design utility creates best quality humor cards for your friends or relatives. Affordable card designing software facilitate non technical user to generate attractive birthday greeting cards by using advance printing settings. Birthday reminding messages can be shows on Windows startup. Backup/import birthday files to share the birthday list with others, add comments to the messages, let the program open any file on birthday or let it remind you some days before. Auto Mail Sender Birthday Edition (AMSBE) is designed to send birthday wishes and season's greetings (cards or messages) automatically, just do a little settings, you can get a convenient tool for sending automatic wishes. FRSGiftRegistry allows retail storeowners to maintain a gift registry. The application is intended for storeowners who currently are, or would like to start, maintaining a baby, bridal, house warming, birthday, or other kind of gift registry.